"This is probably the most artistic thing I’ve done,” she says. "It’s a whole new environment, which makes it fun." A Savannah College of Art and Design graduate and self-described “working photographer,” Webber has been photographing weddings and families for years working with digital photography before discovering the realm of underwater photography about three years ago. Her newfound creativity lead to some smart test-marketing on Instagram, where Webber received immediate reactions and likes to her new underwater photographs. From there, the process took off. Now, she’s creating additional works for her underwater series that include wave triptychs — three-frame images spaced together — and a series of neon mantras. Photographed under water, the neon mantras are custom neon signs attached to a fine art photograph. They’re also perfect for coastal homes and beach houses. As for Webber’s personal mantra? “Dive In” is the one she keeps returning to. Because a mantra, just like water, can have several meanings and layers. But as photography evolves, so, too, does the photographer. And Webber is keenly aware of the intangible nature of digital photography. That’s why she produces quality work meant for display and also why she identifies with her new creative endeavor a little more than some other ventures. But with underwater photography, Webber is able to tap into some of the spirit and freedom that photo shoots and playfulness can offer. In other words, dive in. The water is fine. 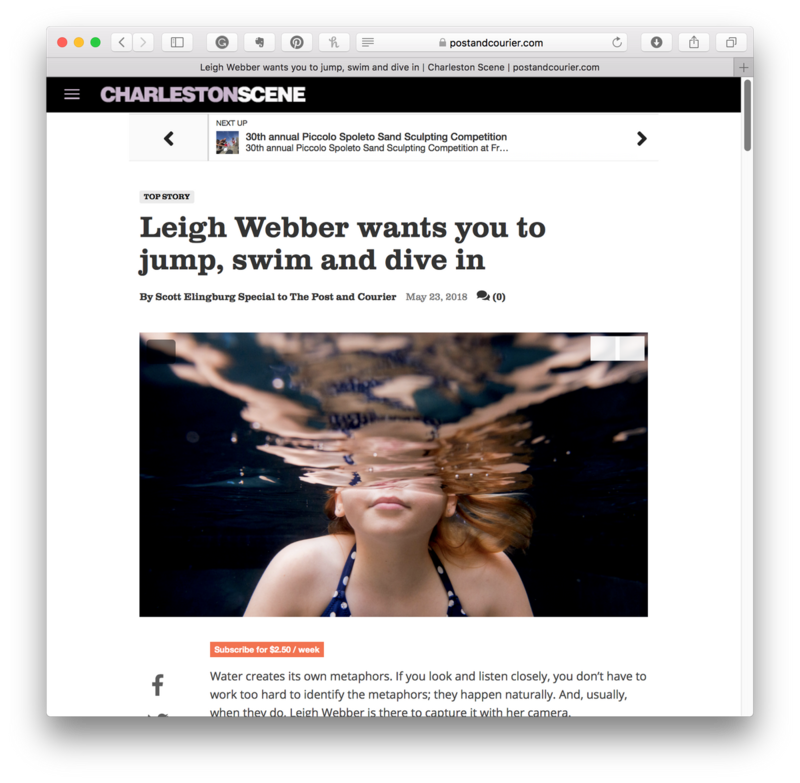 Leigh Webber’s underwater series, Dive In, will be showcased during a show at Fritz Porter Design Collective, in the Cigar Factory at 701 East Bay St., from May 1-June 30. A mid-show party is on May 31, 5-7 p.m. at Fritz Porter.